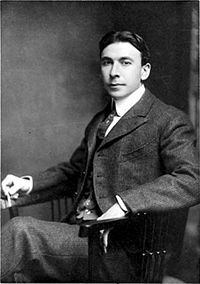 Newton Booth Tarkington (July 29, 1869 – May 19, 1946) was an American novelist and dramatist best known for his Pulitzer Prize-winning novels The Magnificent Ambersons and Alice Adams. Tarkington's works often centered on life in the mid-west among everyday Americans attempting to live out their dreams. His literary pieces earned him much fame and attention during his lifetime and led him to win many awards for his work. His idyllic settings made his novels and plays popular with the public. His work described Americans at their best, living lives of carefree bliss in a blessed land. This may not have described what many people actually experienced but it did represent what many people wanted for themselves and for their families. Tarkington donated substantially to Purdue University and has been recognized for his philanthropy. Tarkington Hall, an all-men's residence hall at Purdue, is named in honor of him. Booth Tarkington was born to a middle-class family in Indianapolis, the son of John S. Tarkington and Elizabeth Booth Tarkington. He was named after his maternal uncle Newton Booth, then the governor of California. He first attended Purdue University (for two years) but graduated from Princeton University in 1893. While at Princeton he was editor of the Nassau Literary Magazine and formed the Princeton Triangle Club. He was also voted the most popular man in his class. When Tarkington's class graduated in 1893 he lacked sufficient credits for a degree at Princeton, where he attended classes for two years. His later achievements, however, won him an honorary A.M. in 1899 and an honorary Litt.D. in 1918. Julia; frontispiece of a 1922 New York publication of Gentle Julia, by Booth Tarkington. In 1893, when Tarkington returned to Indianapolis, he struggled to make a living as a sketch artist and dabbling writer, but finally broke it big in 1900 when The Gentleman from Indiana (published two years earlier by S.S. McClure) became a best-seller. His career as a writer would take off after this and not slow down again during his lifetime. He was one of the most popular American novelists of his time, with The Two Vanrevels and Mary's Neck appearing on the annual bestseller lists nine times. Tarkington's novels are now to have an optimistic tone and mid-western setting. His work seemed to describe the lives of blissful Americans in the heartland. Tarkington's best known work today is The Magnificent Ambersons, due in part to its famous treatment by Orson Welles in 1942 and its frequently favored listing on the Modern Library's list of top-100 novels. It was the second volume in Tarkington's Growth trilogy, which traced the growth of the United States through the decline of the once-powerful and aristocratic Amberson family dynasty, contrasted against the rise of industrial tycoons and "new money" families in the economic boom years after the Civil War leading up to World War I.
Tarkington was also a trustee of John Herron Art Museum (now Indianapolis Art Museum) and wrote on his knowledge of art and used the subject as a setting for one of his stories. Tarkington was married to Laurel Louise Fletcher in 1902. The couple was divorced in 1911. One daughter, Laurel, died as a child. He would go on to marry Susanah Kiefer Robinson of Dayton. She would outlive Tarkington by two decades. Tarkington had several nephews, as well, who went on to publish a collection of the letters he had sent them: Your Amiable Uncle; Letters to His Nephews by Booth Tarkington (1949). 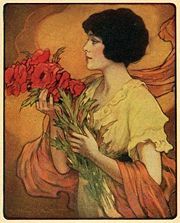 Tarkington was very famous in his time for his literary creations. His novels and plays were highly popular with the public. The setting was usually cheerful and comforting. It described Americans at their best, living lives of carefree bliss in a blessed land. His work has won him much acclaim, now and in the past. He was awarded the Pulitzer Prize for his novels The Magnificent Ambersons and Alice Adams, his most famous works. The short story, "Cider of Normandy," was awarded the O. Henry Memorial Award in 1931. ↑ 1.0 1.1 1.2 My Kennebunks, Booth Tarkington, Booth Tarkington 1869-1946 Retrieved January 30, 2008. ↑ Purdue University, Tarkington Hall, Tarkington Hall Retrieved January 30, 2008. Holliday, Robert Cortes. Booth Tarkington. Garden City, NY: Doubleday, Page, & Co., 1919. My Kennebunks. Booth Tarkington. Booth Tarkington 1869-1946 Retrieved January 30, 2008. Purdue University. Tarkington Hall. Tarkington Hall Retrieved January 30, 2008. Tarkington, Booth. The Gentleman from Indiana. New York: Doubleday & McClure Co., 1900. Tarkington, Booth. Monsieur Beaucaire. New York: McClure, Phillips & Co., 1900. This work was later adapted as a play, an operetta and two films—in 1924 and 1946. Tarkington, Booth. The Two Vanrevels. New York: McClure, Phillips & Co., 1902. Tarkington, Booth. In the Arena: Stories of Political Life. New York: McClure, Phillips & Co., 1905. Tarkington, Booth. Beasley's Christmas Party. New York: Harper & Brothers, 1909. Tarkington, Booth. Penrod. New York: Grosset & Dunlap, 1914. Tarkington, Booth. The Turmoil. New York: Grosset & Dunlap, 1915. This is the first volume of the trilogy Growth. Tarkington, Booth. Penrod and Sam. Garden City, NY: Doubleday, Page, and Company, 1916. Tarkington, Booth. Seventeen. New York: Grosset & Dunlap, 1916. Tarkington, Booth. The Magnificent Ambersons. Garden City, NY: Doubleday, Page and Company, 1918. This book won the 1919 Pulitzer Prize; and was filmed in 1941 by Orson Welles, and remade for TV in 2002. It is the second volume of the trilogy Growth. Tarkington, Booth. Alice Adams. New York: Grosset & Dunlap, 1921. This book won the 1922 Pulitzer Prize and was filmed in 1935. Tarkington, Booth. Gentle Julia. Garden City, NY: Doubleday, 1922. Tarkington, Booth. The Midlander. Garden City, NY: Doubleday, Page and Company, 1924. In 1927, this book was retitled National Avenue. It is the third volume of the trilogy Growth. Tarkington, Booth. The Plutocrat. Garden City, NY: Doubleday, 1927. Tarkington, Booth. Claire Ambler. Garden City, NY: Doubleday Doran & Co Inc., 1928. Tarkington, Booth. Penrod Jashber. New York: Grosset & Dunlap, 1929. Tarkington, Booth. Mirthful Haven. Garden City, NY: Doubleday Doran & Co Inc., 1930. Tarkington, Booth. Mary's Neck. Garden City, NY: Doubleday, 1932. Tarkington, Booth. The Fighting Littles. Garden City, NY: Doubleday Doran & Co Inc., 1941. Tarkington, Booth. Presenting Lily Mars. Garden City, NY: Doubleday Doran & Co Inc., 1933. The book was made into a film in 1943. Tarkington, Booth. Kate Fennigate. Garden City, NY: Doubleday Doran & Co Inc., 1943. This page was last modified on 17 June 2016, at 16:05.